The Islamic Cultural Centre (ICC) incorporates Zakariyya Jame Masjid and Madrassah Khaliliyyah Rashadiyya. 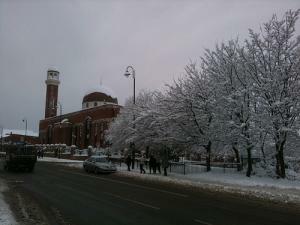 Zakariyya Jame Masjid is the central mosque of Bolton. It marked the beginning of the ICC, which was pivotal in supporting and aiding communities in other areas of Bolton to build further mosques and areas of worship. As a result it still remains as the central mosque in Bolton, playing an important role in uniting and serving all Muslims in the town. It holds a capacity of housing up to 3,000 worshippers and acts as a contact point for many groups, agencies and local authorities on various issues in the borough. Built at a cost of up to £3 million pounds, the Mosque can be proud of the fact that the funds were raised entirely by the generous local Muslim community of Bolton. In addition to facilitating an environment for daily worship it provides Islamic education for the children and adults of the surrounding area and takes up social community responsibilities like holding birth, marriage and funeral arrangements. Situated within easy reach of the M6 the Mosque attracts not only people from Bolton but also people of the Northwest of England and the country as a whole.